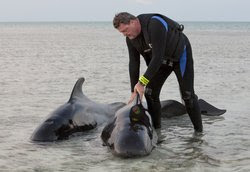 Marine mammal rescuers worked Thursday night to help 16 pilot whales stranded in shallow waters off Cudjoe Key. By 11 p.m., one of the whales had been brought to a quickly constructed pen near the boat ramp at the end of Blimp Road on the island's bayside. Another two were en route, while at least three more would have to wait for high tide to be moved. Two more whales were confirmed dead, according to Karrie Carnes, spokeswoman for the Florida Keys National Marine Sanctuary. Reports came in a little before 7 p.m. that the whales had been found. The Key Largo-based Marine Mammal Conservancy and Florida Fish and Wildlife Conservation Commission officers responded, along with dozens of volunteers, students from Florida Keys Community College and sanctuary staff. Dr. Doug Mader, owner of the Marathon Veterinary Hospital, was on scene and said the outlook was grim. He said in addition to the stranded whales, another three nearby look to be in frail health and won't make it. The future of the confirmed stranded, at an area known as Tarpon Belly, also isn't good. Three of the whales were close to Cudjoe's shallow mangrove shoreline, within sight of the ramp, while others — including a mother and calf — were further out, among the small mangrove islands. Rescuers raced the setting sun and dropping tide to find and assess the whales. A couple of hours later, in scattered locations hundreds of yards from shore under a starry night sky, teams of volunteers were trying to stabilize the whales they found — monitoring their breathing, keeping them wet and walking them to deeper water when possible. Some were in water shallower than knee deep.